WATER CONDTIONING: One way to help minimize the percentage of partial water changes, is by using organic or chemical pond water treatments. ammonia, algae, sludge, pH swings, floating matter, nitrites and nitrates, chlorine, chloramines, and minerals/metals found in ordinary tap water can all be treated with pond water additives. Understanding how and when to use these treatments will help determine their effectiveness. Not knowing how to use these treatment methods can result in fish and plant harm, and sometimes even fish loss. . San Diego Pond Service has years of experience with a variety of organic and chemical pond water treatments. Whether you have a large or small pond, we will can your water crystal clear, algae free, and your koi happy! 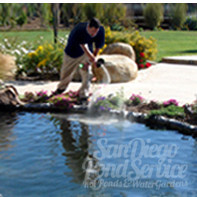 SIGN UP FOR OUR SERVICE: San Diego Pond Service services ponds all over San Diego county. We love our San Diego ponds, our North County ponds, our coastal ponds, and our inland ponds. From Rancho Santa Fe ponds to La Jolla ponds, we care for each account as if it were our own backyard pond! 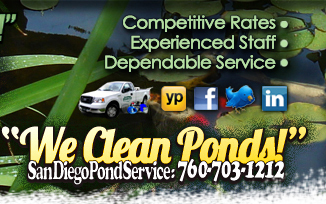 If you are seeking pond service or koi care, don't hesitate to call us! We offer a variety of maintenance programs including weekly service, bi-weekly service, monthly service and even custom flat rates are available to suit your needs. 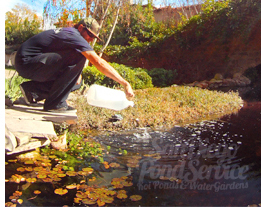 Call San Diego Pond Service today, (760) 703-1212, to schedule a consultation and configure your program or custom rate.